Fill out the personalization fields provided on the item page. This will allow our production team the necessary information so we may create your personalized gift exactly how you want it. It is important to note that some items do not allow for personalization, in which case you can simply add the item to your cart and it will arrive as shown. Can I use special characters in my personalization? We apologize, but at this time, we are only able to produce letters and numbers from the English keyboard. Wherever you see a product with a title on it such as Grandma or Grandpa or Mom or Dad, you can change the title to almost anything you like. Maybe you call your Grandma, Mamaw, or maybe you'd like the item to say Aunt Sally. In almost every case, the title does not have to be as pictured, simply type in what title you would like. The personalization pattern changes with each design, so we do not offer name placement or color guarantees. What is preview and how does it work? On many items, we offer an electronic representation of what your personalized gift would look like based on the personalization fields you have completed. This is a virtual representation of the final product and is only to be used as a guide of what your gift will look like. How Does preview work for Word-Art? The preview of Word-Art is computer generated. We do not have control over the placement of the words that have been entered on the order form. You are able to regenerate the preview as many times as you would like. 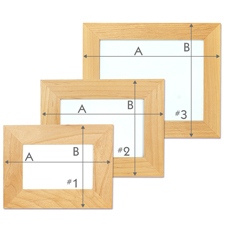 Once you see and approve the layout you like the image will be saved for our staff to print to your item. For this reason we are unable to make any changes to a Word-Art piece. Can I enter more characters to my personalization than the site is allowing? Character limits can vary from item to item. These limits are intentionally set to maintain visual quality and cannot be exceeded. Can I customize my item beyond the options available on the website? We make all possible options to personalize your item available on our site. We are unable to offer any further customizations other than those shown on the page of the item. Once an order is shipped from our warehouse, an email confirmation will be sent to the email address on file with your tracking number. If your order was placed online you can check your order status online here. Please note: it may take up to 24 hours for the carriers to show updated order status on your order. If your order was placed through the mail or over the phone please contact us by phone or email and we will gladly update you on the status of your order. Do you require your gift to arrive quickly? We offer faster shipping methods. The Amazon Checkout option is simply for convenience. By selecting Checkout With Amazon, you are not placing your order on Amazon but logging in to your Amazon account to access your address book and saved payment methods. Please note that Amazon Prime members do not receive free shipping by choosing to checkout through an Amazon account. How do I add a Discount/Coupon Code? Discount codes may be entered in the Blue Discount Code box that is located under the last item in your Shopping Cart to the left of the checkout button. Please note that only one code may be applied per order and discounts may or may not apply to items already on sale or clearance priced. We will give you the better of the two options using the in-cart price. Coupon codes cannot be applied to previous or pending orders. Can my items be gift boxed? Our Gift Box Service is available on most personalized gifts. We gently place your gift inside premium white tissue paper, surround it with an elegant black gift box and finish off the gift presentation with a silver bow, all for a just $4.48 per item. If you would like to select this service simply check the Gift Box option for each personalized gift located in your personal shopping cart. Only items which fit in our elegant gift boxes have the gift box service option. Can I include a personal gift card? How else can I add a personal message with an order? Add a brief gift message to let the recipient know this gift is from you. For no charge you can enter a short message that will appear on the packing slip that is included in the package. The packing slip will not include any pricing information. To add this message simply check the ‘This is a Gift’ box located in the Gift Option section of the second step of the checkout. For shipping address, enter the address where you would like us to deliver your order. For billing address, be sure to use address of record for your credit card, Paypal or Amazon account. If your billing address doesn’t match your order may not be able to be processed. The address I entered is correct but the site will not accept it? To ensure that your order is properly delivered we cross reference the addresses provided with the USPS address database. Our website may provide you with a corrected address to match the information listed in the USPS address database. These changes can include correcting abbreviations such as Dr to Drive. To proceed through the checkout you can accept the suggested address or select to use the address as entered. If you have any concerns please feel free to contact us. GiftsForYouNow.com makes is a priority to make shopping for personalized gifts as easy and effortless as possible. We put quality service first, so we take every measure that we can to ensure that your order is made with care correctly and sent to you in a timely fashion. We are proud of the products that we create and want to do everything that we can to make our customers happy. Can I add names to an item that I already have? We're not able to add names to an existing item. However, if you've purchased an item from us in the past year and want to add names, we'll be happy to make another for you at a discounted price. Doing so will allow you to keep the original item, and not spend any time, trouble or money to ship it back to us. Simply call us, toll-free, at 1-866-443-8748 to arrange for a discounted replacement. Changing your password is simple. After logging in to your account, click on the ‘My Account’ link then select ‘Change Password’. Here you will enter your current password and new password. Once you have entered the new password, click on Save Changes and your password will be changed. If you have forgotten your password, you may click the link and follow the prompts to get a new temporary password. The email address provided on your account is used for order and shipping confirmations, emails regarding any questions we may have about your order as well as email coupons and promotions. Changing the email address on your account is simple. After logging in to your account, click on the "My Account" link then select "Change Email". Here you can provide a new email address for these communications. Please note that your username will not change by changing the email address on the account. Where can I find my Groupon Voucher code? How do I provide the personalization for my item? After receiving a voucher code from Groupon.com visit, www.GiftsForYouNow.com. Once on the site, locate the item the voucher is valid for and enter the desired personalization. My voucher is good for multiple items. How do I add more than one to my cart? If a voucher is valid for more than one item and would like the desired personalization is to be the same on the items, simply change the number next to the ‘Add to Cart’ button to the number being ordered. If different personalization is wanted on the items they will need to be added to the cart separately. Where do I enter my Groupon voucher code? A Groupon voucher code may be entered in the blue discount code box. This is located in the shopping cart, under the last item in the cart on the left side of the screen. Please be sure to click the 'Apply' button after entering the code. I have more than one voucher code, can they all be applied to one order? Only one code may be applied per order. Individual orders will need to be placed for each voucher code. I have a coupon code from GiftsForYouNow.com. May I apply this code to my order? Discount codes may not be combined with Groupon voucher codes. Why is the site asking for my billing information? Voucher codes do not include shipping costs. Shipping costs will need to be paid at the time of voucher redemption. 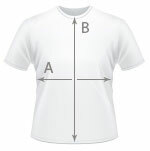 We use American brand name adult T-Shirts and Sweatshirts in Unisex sizes. 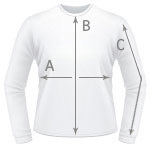 Our sweatshirts are 50/50 Cotton/Polyester and run very true to size with very little shrinkage. 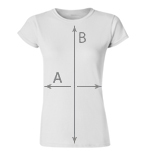 Our t-shirts are 100% Cotton and may experience limited shrinkage. 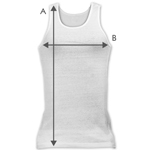 The body length is measured in a straight line from the highest point of the shoulder at the join of the collar to body to the bottom edge. 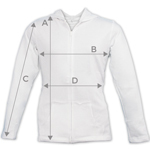 A garment is measured on a flat work station with the front of the garment facing up. The garment is measured in a relaxed state. SM 18" 26" 32 1/2" 28" - 29"
MD 19" 27" 33" 30" - 31"
LG 20" 28" 33 1/2" 32" - 33"
XL 21" 29" 34" 34" - 35"
2XL 22" 30" 34 1/2" 36" - 37"
SM 32 1/2" 16 1/2"
MD 33 1/2" 17 1/2"
XL 34 1/2" 19 1/2"
XS (2/4) 15" 19" 5-6 43"-46"
SM (6/8) 17" 21" 7-8 50"-52"
MD (10/12) 18" 22.5" 10 54"-58"
LG (14/16) 19" 24" 12 58.5"-60"
XS (2/4) 15" 19" 23.5" 5-6 43"-46"
SM (6/8) 17" 21" 26.5" 7-8 50"-52"
MD (10/12) 18" 22.5" 27.75" 10 54"-58"
LG (14/16) 19" 24" 30.25" 12 58.5"-60"